Physical attributes. Connectors are on the rear panel, and the control keypad is located on the front portion of the right panel. Air intake vents are on the front and left panels, and the heat exhaust vent is on the rear portion of the right panel. Eco Modes. There are two options for running at lower brightness to save power and reduce fan noise. Eco1 lowers brightness by about 14% and Eco2 by about 52%. Presentation Optimized Lumens. Many projectors have a green cast when set to their brightest picture mode, but the P502WL-2 exhibited almost no green bias when set to High-Bright mode. As a result, High-Bright is the best choice for delivering well-saturated color for business presentations. At 5435 lumens, High-Bright mode can keep images from washing out even in high ambient light conditions. Video Optimized Lumens. Movie mode reproduces flesh tones better than any any other picture mode, and even with slight changes to the default brightness and contrast settings, it still delivers over 3400 lumens—plenty bright for family room viewing of sports events even if all the windows can't be shaded. Zoom Lens Brightness Reduction. The 1.7:1 zoom lens reduces brightness by 20% at full telephoto and delivers 4350 lumens in High-Bright mode. Brightness Uniformity. The combination of lens and laser/phosphor light source in the P502WL-2 delivers excellent brightness uniformity of 92%, an unusually good result. No hot spots or shadings are visible with any image content. Input Lag. Input lag is 66 ms. That's fast enough for a few action simulations but serious gaming or applications involving high speed simulations fast would call for faster response time. Built-in Audio. The P502WL-2's built-in 20-watt speaker is sufficient for small rooms, but larger venues will likely require external audio amplification. Fan Noise. Fan noise is surprisingly low for such a bright projector. In either of the Eco modes, it is indistinguishable from background noise, and even in normal power modes, it is comprised of low and medium frequencies, so it is not a distraction in all but the quietest scenes. If operating the P502WL-2 at altitudes higher than 5,500 feet, NEC recommends using the high fan speed setting. The fan noise increases in all modes, but it is less intrusive than most projectors we've tested. Throw Distance. The P502WL-2's 1.7:1 zoom lens provides a throw distance range for a 150-inch diagonal image of approximately 13 feet, 9 inches to 23 feet, 9 inches. You can establish the correct throw distance for your screen size with the NEC P502WL-2 Projector Throw Calculator. Mounting and Lens Shift. Thanks to its relatively small size and weight (19.4 lbs. ), the P502WL-2 is easy to mount. Combined with a 1.7:1 zoom lens range, the horizontal and vertical lens shift make it simple to position the image even if small mounting errors have occurred. On our test unit with a 150-inch image projected and maximum vertical lens shift up, the bottom of the image is about 10.5 inches above the center of the lens. With maximum vertical lens shift down, the bottom of the image is about 62 inches below the center of the lens. This vertical lens shift far exceeds the P502WL-2's specification of +59% of image height. The horizontal shift measured from the centered position is ±28% of the image width. 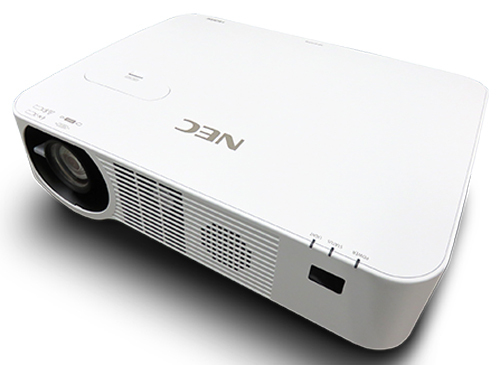 The NEC P502WL-2 Laser Projector has improved substantially on its predecessor, the NEC P502WL Laser Projector. With 5,000-lumen brightness, a street price under $2,300, and a potent combination of lens shift and 1.7:1 optical zoom, this is the brightest, least expensive, and easiest-to-install WXGA projector on the market. Even though it may be primarily designed for classrooms, boardrooms, and conference facilities as a data projector, the P502WL-2 is an excellent choice for home entertainment purposes. While its 1280x800 native resolution may keep it from reaching home theater status, it will do a terrific job of presenting sporting events for a family or neighborhood gathering in the living room on a Sunday afternoon. The video quality is excellent with good black levels and highlight rendering, and it is bright enough that it can be run in its Eco1 mode to reduce fan noise. For larger rooms, ceiling mounting the P502WL-2 may be necessary, and that is where its placement flexibility shines. First, the 1.7:1 zoom ratio extends the range of projection distances that will produce the same image size. For example, to project a 150" image, the projector can be placed anywhere from 14-24 feet from the screen. It's generous vertical lens shift further simplifies installation. It is not often that a projector exceeds its brightness specification, but our test unit put out over 5,400 lumens in its High-Bright picture mode. The pleasant surprise was that there was no apparent green tint that often accompanies the high brightness setting for lamp-based projectors, making this a highly usable mode. The P502WL-2's laser/phosphor light engine not only sports a long life (20,000 hours specified), but it delivers its brightness with good color neutrality. The P502WL-2 is one of the few projectors in its class with 3D capability. It is a top-notch data projector, but it also steps up nicely for home entertainment purposes. It is easy to install, and its cost of ownership is low by virtue of its laser-based light engine. Top it all off with a five-year or 20,000-hour warranty, and you have a prime value proposition.